Think of this as a bit of Content Marketing 101 – or maybe given the other content marketing posts I’ve written, this is 201, or for some of you advanced library marketers, take a little mid-term break?! 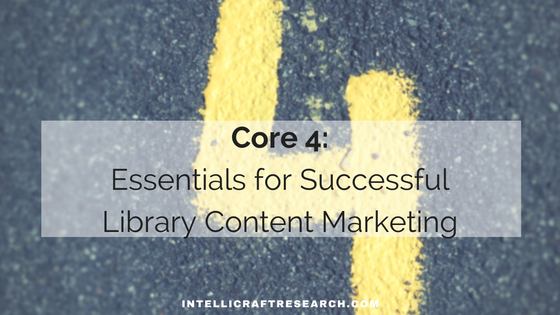 There are a core four essential pieces that the rest of your content and communications are based on. Understand and build a strong foundation as your base, and you and your organization are positioned for an easier time executing and seeing success in using content marketing. You should already have some or all of these in place as part of your library’s marketing plan, so it will be easy to transition to thinking of them as part of your CM process. But without these foundation pieces your marketing gets wobbly, so don’t neglect ANY of the core 4! After talking about, and defining, what content marketing is and some of what it’s not – let’s start with the basic foundation of how to do this thing called ‘content marketing’! No matter if you’re a big B2B like GE’s plane engines division (seriously, they have quite the Instagram account and they’re on Tumblr – the ROI? Not sure! ), a small solopreneur, a public library branch , a college library or a local nonprofit – there are ways to make content marketing work for your org. But all need the same basic foundations to good CM. If you’ve already got these pieces in place and working together for your marketing, you’re ahead of the game and ready to put a content marketing plan and process in place. It’s important that your content has a home. You want to drive [targeted!] traffic to that home. 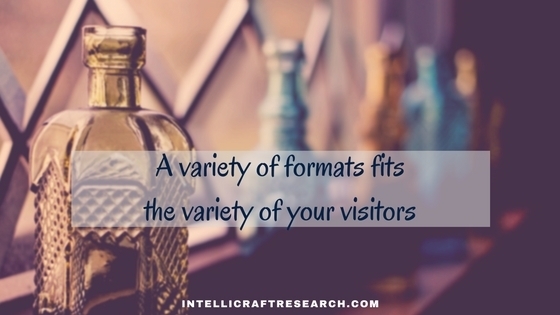 Your website (or blog) is your ‘home base’. You don’t really want to drive traffic someplace else. You don’t want your blog to exist on a different platform or site. One of the reasons you can’t rely on an all-social-media platform or only having a Facebook page or spending too much time building a Facebook fan base = You don’t own it. They own the space and the traffic, you’re just renting. Any content you share anywhere should drive traffic to your website. You OWN your site and the prime online real estate it occupies. It doesn’t matter if you have a bricks and mortar business, operate out of your home office, sell cupcakes strictly online, coach in your pajamas or lead a multi-state, multi-site library system. 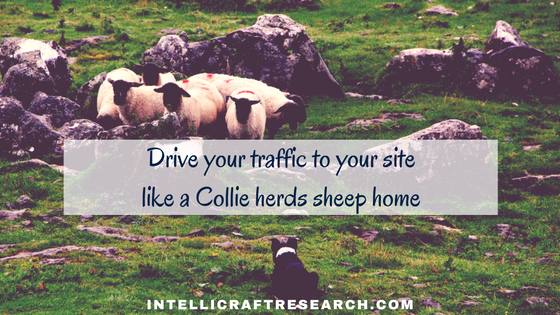 Driving traffic to your website, like a good Collie herds sheep to the pasture, will ultimately convert into customers, clients, patrons or users. Online or offline. This is just as true for libraries as it for those retail orgs, B2B companies or solopreneurs. The content that you create must be engaging, compelling and work to educate your audience about your products and/or services. What you deliver matters as much, or more, than HOW you deliver it. There are many forms which this content can, and should, take. Not every member of your audience wants to interact with content in quite the same way. Some like to read, others to watch videos, and others prefer listening to short or long pieces (the rise – again- of podcasting proves this!). 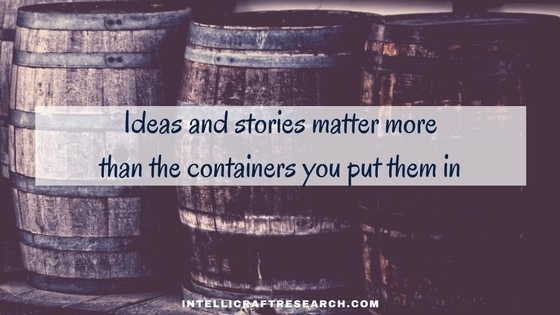 Busy but detail-oriented folks may want to download a PDF or ebook with your original research and community stats. Other folks want to listen to staff book picks and reviews via a podcast while at the gym. Sometimes the same member of your audience may try ALL formats or channels – depending on mood, context, environment, and what’s in your content. Think of this the same way your library has a book available as a hardback, in large-print, as a Kindle ebook or an EPUB from OverDrive, or as an audio book on Hoopla, or as a PlayAway. We understand that for the resources in our libraries. So why isn’t your library’s content and communications for marketing available in a variety of text, visual or a/v formats?! It needs to be. Blog posts and articles, both on and off your website, short reports, white papers (very common in the business + B2B arena), eBooks, videos (short, long, animated, voice-over slides, animated and more), and podcasts are all types of content that can be part of your arsenal. They’re all potential distribution channels. Each may have a preferred platform to go with it and be a potential traffic driver. 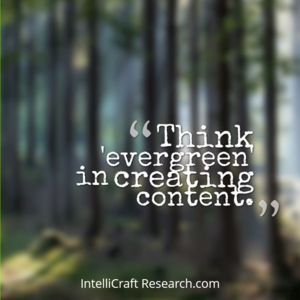 BUT … Don’t worry about trying to create all of those types of content! Just like your library probably doesn’t have EVERY book in every format, not every piece of content needs to be everywhere. Experiment and see what you feel good about creating, and what your audience responds to, shares, and likes consuming. And if you’re not sure – ASK them! container you put them in. 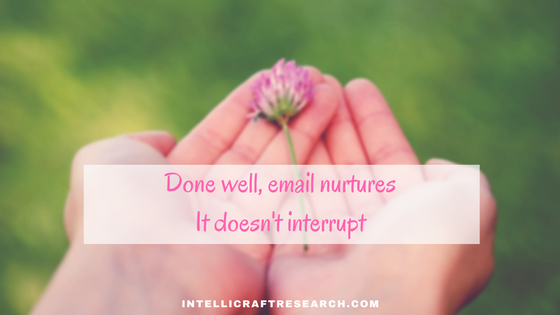 One of the lesser understood keys to using content marketing to grow successfully, is email. Use your content and lovely traffic to build your email list. You create great content on topics that are highly relevant and useful to your audience, attracting your ideal target audience to your website. Then you ask them to sign up for your email list. You might offer them a goodie, a freebie, an opt-in gift to make it more worth their while. Once they sign up for your email list, you can send them more content, educating and engaging with them and building a relationship. No, email marketing is not dead. Yes, people still sign up and read emails. IF … you send helpful, useful, engaging stuff. Let them get to know your organization. Only then do you encourage them to purchase your products and/or services, make a donation, volunteer their time or come visit you. And all of this will be easier because they’ve given you permission to talk with them and you used that to create a relationship. Yes, email marketing matters to libraries too – you are NOT off the hook here. Don’t panic though. I’ll have more posts and tips on email marketing how to translate terms and ideas like ‘lead magnets’, ‘opt-in’ or ‘landing page’ to library use. Or check my A to Z Marketing Terms Glossary for those concepts to see some examples. Just know for now that an email list is key. You should and CAN use your library data and patron permission to send more than ‘pick up your hold’ emails. Before we get into details, make sure you have a proper email marketing service account (because you can NOT use your ISP, Gmail or any basic email service for opt-ins and email marketing). I never said social media isn’t important. It just can’t come at the expense of your home base or turn into your ‘base.’ It’s a brilliant source of increased visibility and traffic. Social media is a great tool for promoting your organization. It has wide reach, it’s easy to create accounts, most of it is free, and chances are pretty darn good your ideal customer/client/user is on one of the big social platforms. Social media is an ideal way to encourage your audience to share your content with others. 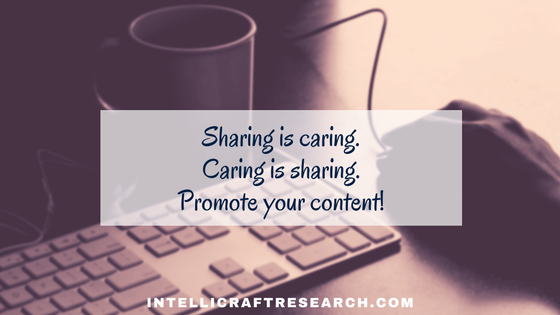 Share all your content on social media, including your blog posts, articles, short reports, videos and more. Find the tools and plugins that make it easy to place buttons on your site to make sharing easy. Link your blog or website with your org’s social media accounts. Some of this can even be automated. [e.g. the Publicize module inside the Jetpack plugin for WP– LOVE it; Click to Tweet plugin – got it! Shareaholic plugin – using that! ] Social media sharing gives you an opportunity to attract the friends of your audience so that you can build a larger following. Core Four. 4 parts. Sounds simple, right? Well it is. Sort of. Not sure of the marketing cycle? Or strategy? Ok, we’ll go over that, but meanwhile check out the terms and examples in the Library Marketing Terms Glossary. We’ll soon go over setting goals or objectives for your marketing (and content), learning to love planning and scheduling with editorial calendars, researching to create solid content and more. Strategy, plans, schedules and good tools all lead to content that is easier to create, educational, engaging and gets the results that you desire.